These pendants each contain an unpolished crystal point accented with a beautiful spiral designed mount. 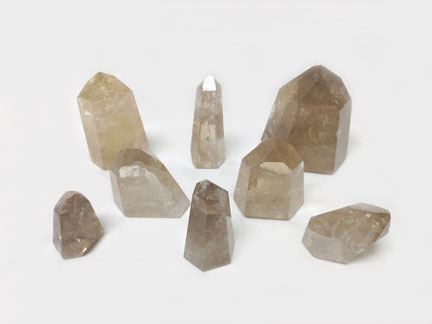 Approximately 1.5"L X 3/4"W. Comes with 18" gold or silver plated chain and choice of Amethyst, Citrine, Quartz, or an assortment of available styles. Also available in A-Grade (PMNCP/A) and Freeform (PMNCDT)!! 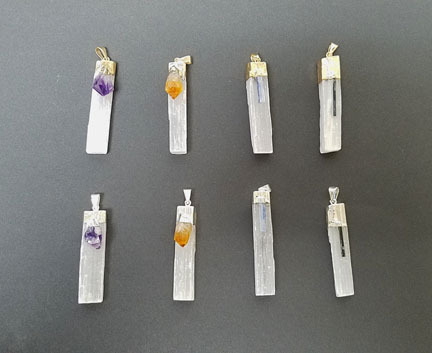 These gold or silver plated pendants come in a selection of four different semi-precious rough crystal points: Amethyst, Citrine, and Quartz points mounted with a cap setting. Approximately 1"L X .5"W. Comes with 18" gold or silver plated chain. These pendants each contain a piece of Selenite garnished with a gorgeous mineral accent and mounted on a gold or silver plated bell cap. Approximately 1"L X .5"W. Comes with 18" gold or silver plated chain. You can choose between Amethyst, Black Tourmaline, Citrine, Blue Kyanite, or you can just get assorted styles! These pendants each contain an unpolished crystal point mounted on a gold or silver plated cap with a beautiful spiral attached to the top. Approximately 2"L X 3/4"W. Comes with 18" gold or silver plated chain and choice of Amethyst, Citrine, or Quartz point.